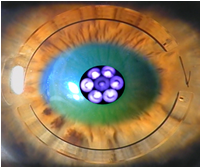 Intracorneal ring segments (Intacs) may be used as an additive procedure to corneal collagen crosslinking for keratoconus (CXL). The two procedures have different goals. Intacs acts to reshape the cornea, flattening the cone and improving the corneal optics. The goal of CXL is to decrease the progression of keratoconus. Depending on your condition, we may recommend these procedures for you. For patients having both the Intacs and CXL procedure, first the channel for the Intacs is created with the femtosecond laser. Next, the surface epithelial cells of the cornea are removed and riboflavin drops are administered until they fully soak into the cornea. After we are sure that the riboflavin is completed distributed within the cornea, the ultraviolet light portion of the procedure begins. The patient then looks at a UV emitting light. During that time, we continue to administration riboflavin drops. At the conclusion of the CXL procedure, the Intacs are placed within the previously prepared channels. Antibiotic and anti-inflammatory drops are used for two weeks afterward.